We made a mistake in our last post discussing CIFS vs. NFS results using SPECsfs2008 benchmarks by including some storage systems that had SSDs in this analysis. All of our other per spindle/disk drive analyses exclude SSDs and NAND cache because they skew per drive results so much. We have corrected this in the above chart which includes all the SPECsfs2008 results, up to the end of last month. However, even with the corrections the results stand pretty much the way they were. CIFS is doing more throughput per disk drive spindle than NFS for all benchmark results not using SSDs or Flash Cache. Dropping SSD results changed the linear regression equation. Specificall, the R**2 for CIFS and NFS dropped from 0.99 to 0.98 and from 0.92 to 0.82 and the B coefficient dropped from 463 to 405 and from 296 to 258 respectively. I would be remiss if I didn’t discuss a few caveats with this analysis. Now there are even less results in both CIFS and NFS groups, down to 15 for CIFS and 38 for NFS. For any sort of correlation comparison, more results would have better statistical significance. In the NFS data, we include some NAS systems which have lots of DRAM cache (almost ~0.5TB). We should probably exclude these as well, which might drop the NFS line down some more (at least lower the B value). There are not a lot of enterprise level CIFS systems in current SPECsfs resuslts, with or without SSD or NAND caching. Most CIFS benchmarks are from midrange or lower filers. Unclear why these would do much better on a per spindle basis than a wider sample of NFS systems, but they obviously do. All that aside, it seems crystal clear here, that CIFS provides more throughput per spindle. In contrast, we have shown in the past posts how for the limited number of systems that submitted benchmarks with both CIFS and NFS typically show roughly equivalent throughput results for CIFS and NFS. (See my other previous post on this aspect of the CIFS vs. NFS discussion). Also, in our last post we discussed some of the criticism leveled against this analysis and provided our view to refute these issues. Mostly their concerns are due to the major differences between CIFS state-full protocol and NFS stateless protocol. But from my perspective it’s all about the data. How quickly can I read a file, how fast can I create a file. Given similar storage systems, with similar SW, cache and hard disk drives, it’s now clear to me that CIFS provides faster access to data than NFS does, at least on a per spindle basis. Nevertheless, more data may invalidate these results, so stay tuned. Why this is should probably be subject for another post but it may have a lot to do with the fact that it is stateless…. There really wasn’t that many new submissions for the Storage Performance Council SPC-1 or SPC-2 benchmarks this past quarter (just the new Fujitsu DX80S2 SPC-2 run) so we thought it time to roll out a new chart. 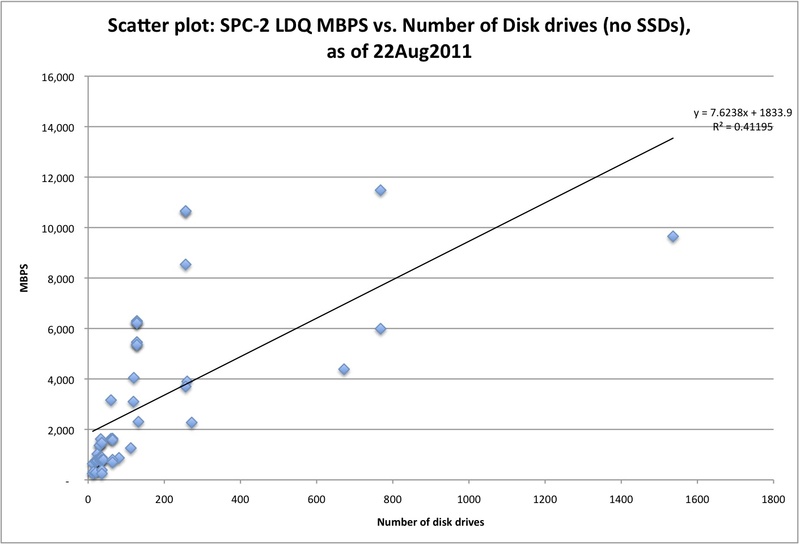 The chart above shows a scatter plot of the number of disk drives in a submission vs. the MB/sec attained for the Large Database Query (LDQ) component of an SPC-2 benchmark. As one who follows this blog and our twitter feed knows we continue to have an ongoing, long running discussion on how I/O benchmarks such as this are mostly just a measure of how much hardware (disks and controllers) are thrown at them. 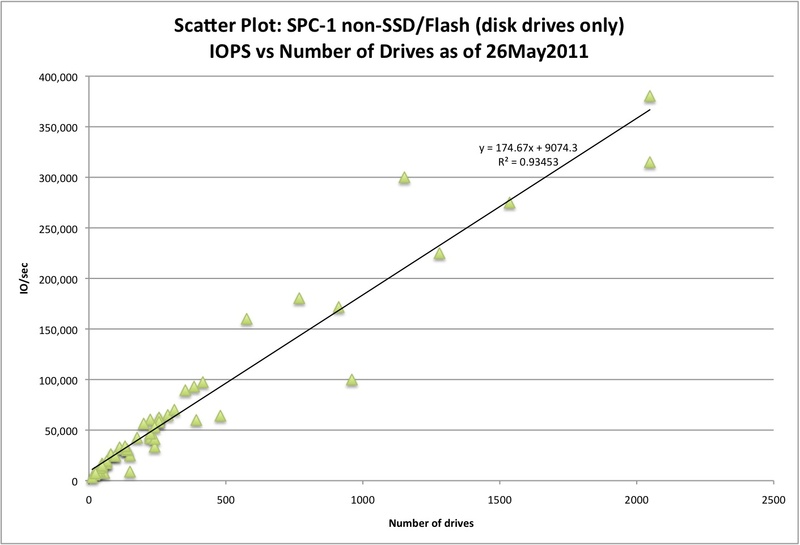 We added a linear regression line to the above chart to evaluate the validity of that claim and as clearly shown above, disk drive count is NOT highly correlated with SPC-2 performance. We necessarily exclude from this analysis any system results that used NAND based caching or SSD devices so as to focus specifically on disk drive count relevance. There are not a lot of these in SPC-2 results but there are enough to make this look even worse. We chose to only display the LDQ segment of the SPC-2 benchmark because it has the best correlation or highest R**2 at 0.41 between workload and disk count. 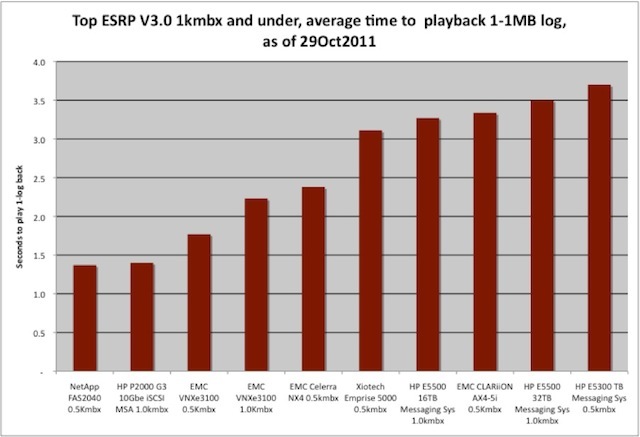 The aggregate MBPS as well as the other components of the SPC-2 benchmark include video on demand (VOD) and large file processing (LFP) both of which had R**2’s of less than 0.36. For instance, just look at the vertical centered around 775 disk drives. There are two systems that show up here, one doing ~ 6000 MBPS and the other doing ~11,500 MBPS – quite a difference. The fact that these are two different storage architectures from the same vendor is even more informative?? Why is the overall correlation so poor? Most of the SPC-2 workload is sequential in nature. How a storage system detects sequentiality in a seemingly random IO mix is an art form and what a system does armed with that knowledge is probably more of a science. In the old days of big, expensive CKD DASD, sequential data was all laid out in consecutively (barring lacing) around a track and up a cylinder. These days of zoned FBA disks one can only hope that sequential data resides in laced sectors, along consecutive tracks on the media, minimizing any head seek activity. Another approach, popular this last decade, has been to throw more disks at the problem, resulting in many more seeking heads to handle the workload and who care where the data lies. IO latency is another factor. We have discussed this before (see Storage throughput vs IO response time and why it matters. But one key to systems throughput is how quickly data gets out of cache and into the hands of servers. Of course the other part to this, is how fast does the storage system get the data from sitting on disk into cache. 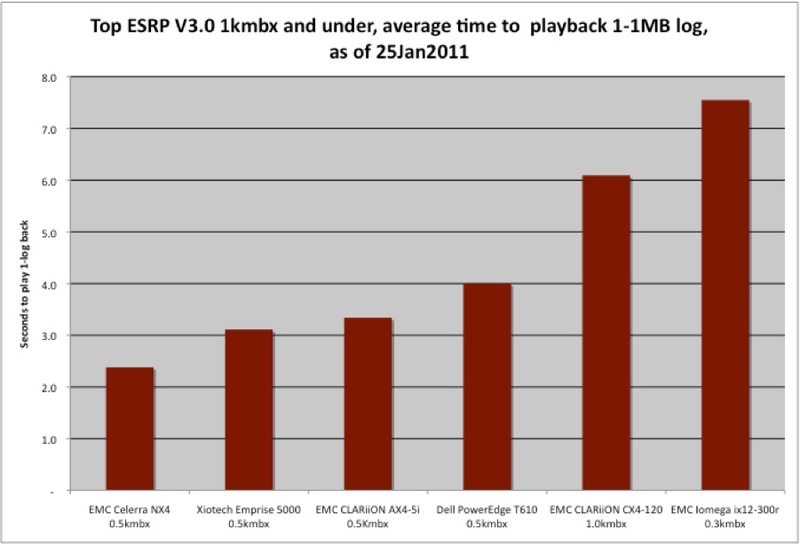 Systems that do these better will perform better on SPC-2 like benchmarks that focus on raw sequential throughput. The full SPC performance report went out to our newsletter subscribers last month. A copy of the full report will be up on the dispatches page of our website later next month. However, you can get this information now and subscribe to future newsletters to receive these reports even earlier by just sending us an email or using the signup form above right. When last we discussed this topic, the tides had turned and the then current SPECsfs 2008 results had shown that any advantage that CIFS had over NFS was an illusion. Well there has been more activity for both CIFS and NFS protocols since our last discussion and it showed, once again that CIFS was faster than NFS but rather than going down that same path again, I decided to try something different. As a result, we published the above chart which places all NFS and CIFS disk only submissions in stark contrast. 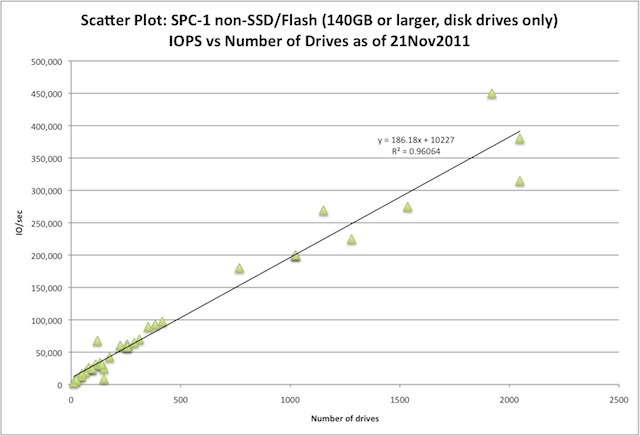 This chart was originally an attempt to refute many analysts contention that storage benchmarks are more of a contest as to who has thrown more disks at the problem rather than some objective truth about the performance of one product or another. But a curious thought occurred to me as I was looking at these charts for CIFS and NFS last month. What if I plotted both results on the same chart? Wouldn’t such a chart provide some additional rationale to our discussion on CIFS vs. NFS. 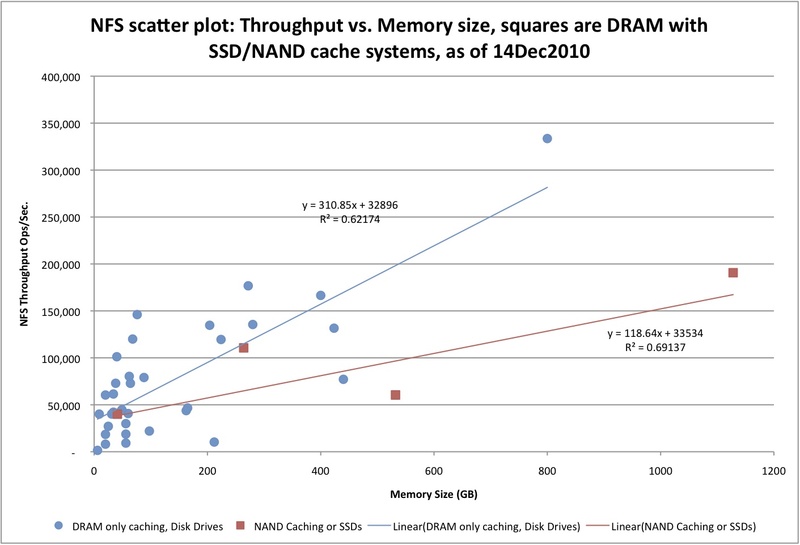 I have tried to eliminate any use of SSDs or NAND caching from this chart as they just confound the issue. Also, all disk-based, NFS and CIFS benchmarks are represented on the above charts, not just those that have submitted both CIFS and NFS results on the same hardware. There is an industry wide view that CIFS and NFS are impossible to compare because one is state-full (CIFS) and the other state-less (NFS). I happen to think this is wrong. Most users just want to know which is faster and/or better. It would be easier to do analyze this if SPECsfs2008 reported data transfer rates rather than operations/second rates but they don’t. As such, one potential problem with comparing the two on the above chart is that the percentage of “real” data transfers represented by “operations per second” may be different. Ok, this would need to be normalized if they were a large difference between CIFS and NFS. But when examining the SPECsfs2008 user’s guide spec., one sees that NFS read and write data ops is 28.0% of all operations and CIFS read and write data ops is 29.1% of all operations. As they aren’t that different, the above chart should correlate well to the number of data operations done by each separate protocol. If anything, normalization would show an even larger advantage for CIFS, not less. Another potential concern one needs to consider is the difference in the average data transfer size between the protocols. The user guide doesn’t discriminate between access transfer rates for NFS or CIFS, so we assume it’s the same for the two protocols. Given that assumption, then the above chart provides a reasonable correlation to the protocols relative data transfer rates. The one real concern on this chart is the limited amount of CIFS disk benchmarks. At this time there are about 20 CIFS disk benchmarks vs. 40 NFS disk benchmarks. So the data is pretty slim for CIFS, nonetheless, 20 is almost enough to make this statistically significant. So with more data the advantage may change slightly but I don’t think it will ever shift back to NFS. Ok, now that I have all the provisos dealt with, what’s the chart really telling me. 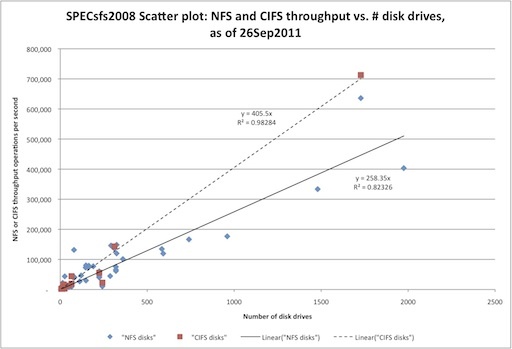 One has to look at the linear regression equations to understand this but, CIFS does ~463.0 operations/second per disk drive and NFS does ~296.5 operations/second per disk drive. What this says is, for all things being equal, i.e., the same hardware and disk drive count, CIFS does about 1.6X (463.0/296.5) more operations per second than NFS and correspondingly, CIFS provides ~1.6X more data per second than NFS does. The full SPECsfs 2008 report went out to our newsletter subscribers last month. The above chart has been modified somewhat from a plot in our published report, but the data is the same (forced the linear equations to have an intercept of 0 to eliminate the constant, displayed the R**2 for CIFS, and fixed the vertical axis title). A copy of the full SPECsfs report will be up on the dispatches page of our website later next month. However, you can get this information now and subscribe to future newsletters to receive these reports even earlier by just emailing us at SubscribeNews@SilvertonConsulting.com?Subject=Subscribe_to_Newsletter or using the signup form above and to the right. As always, we welcome any suggestions on how to improve our analysis of SPECsfs or any of our other storage system performance discussions. We return to our periodic discussion of storage system performance, this time on SPECsfs(r)2008 benchmark results for NFS file serving ops per second vs. system reported memory size. For some obscure reason, I was very intrigued with this chart. We have broken the data out to show those system that only used DRAM in system memory with only hard disk drives and those systems that also included either NAND cache in system memory or SSDs. Current SPECsfs2008 results show 33 systems with DRAM and disk drives and only 6 using SSDs or NAND cache for NFS results. The horizontal axis shows system memory size for the systems under test and doesn’t include SSD capacity (considered drive capacity by SPECsfs2008) size but does include NAND cache size (considered system memory by SPECsfs2008). The vertical axis shows maximum NFS throughput operations per second attained by the storage. The two lines are Excel generated linear regressions across the two sets of data (DRAM-Disk only systems and SSD or NAND caching systems). Given the limited data we probably can’t conclude much from the SSD-NAND linear regression line other than it’s different and somewhat less than what can be gained on average from a system using DRAM and disk only. Also the regression coefficient (R**2) of either linear regression is not that great (~0.62 for DRAM-Disk only and ~0.69 for SSD or NAND use) which might be stretching any real discussion based on statistical normalcy. Nevertheless, one question that emerges is why would SSD or NAND use not generate an relatively equivalent amount of NFS throughput as systems with DRAM only? Obviously, NAND-SSDs access times are not as fast as DRAM. Thus, if I had 800GB of DRAM, I could potentially access data faster than if I had 800GB of NAND cache or SSDs, all things being equal. However, when talking about access time frames at the sub-msec level one would think it wouldn’t make that much of a difference, but apparently it does. Also, given the limited data on SSDs vs. NAND cache use, it’s hard to make any distinction between these two types of systems but one can hope that as more data comes in, we can answer this as well. Another question is whether SSD capacity should be considered system memory or drive capacity for benchmark purposes. SPECsfs2008 states that SSD size should be considered drive capacity but that’s open to some debate which more data could help resolve. Finally, missing from SPECsfs2008 reports is any statement of system cost. As such, it’s impossible to add any measure of relative cost effectiveness factor to this discussion. However, given the current price differential (on $/GB) between DRAM and NAND memory or SSD capacity, one could probably conclude that on a cost effectiveness basis the relative advantages of DRAM only systems might diminish. But without system cost information that’s difficult to quantify. The full performance dispatch will be up on our website after month end but if one is interested in seeing it sooner sign up for our free monthly newsletter (see subscription widget, above right) or subscribe by email and we will send the current issue along with download instructions for this and other reports. If you need an even more in-depth analysis of NAS system performance please consider purchasing SCI’s NAS Buying Guide also available from our website. As always, we welcome any constructive suggestions on how to improve any of our storage performance analysis.